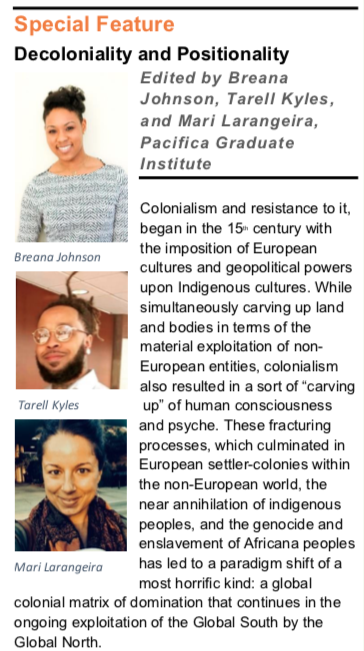 The Spring 2019 issue of The Community Psychologist features the work of Pacifica’s Community, Liberation, Indigenous, and Eco-Psychologies (CLIE) specialization. This Special Feature, curated by student editors, Breana Johnson, Tarell Kyles and Mari Larangeira, is dedicated to Decoloniality and Positionality and includes publications by a number of CLIE student authors. The online version will be available shortly.